As your new President, I want, to tell you a little about myself. I have been a member of MQA for almost ten years, having previously served MQA as a Regional Rep, Education Director and Membership Director. I have lived in Tupelo, Mississippi for over twenty years. 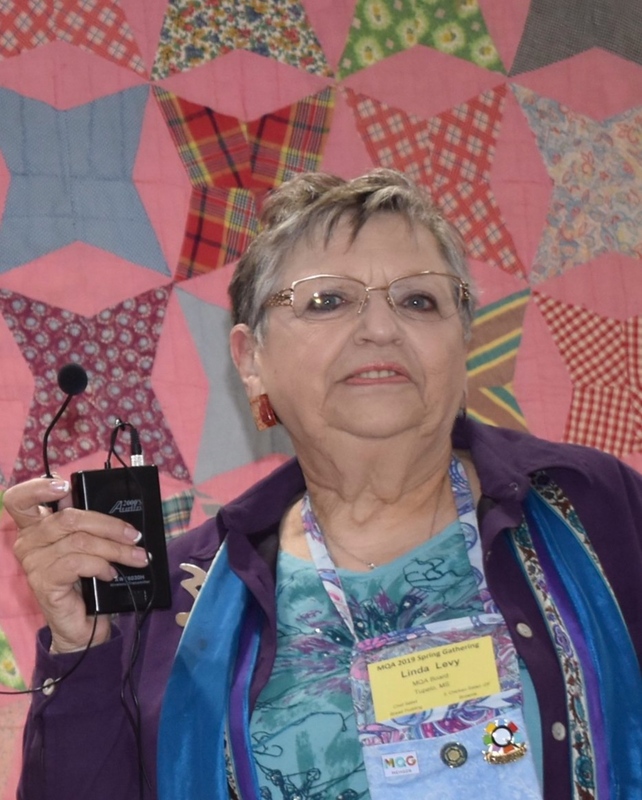 I was first exposed to the current quilting world about ten years ago by a friend who was a member of the Sew Peaceful (now Gumtree) Guild of Tupelo. I am a member of Gumtree, Golden Triangle in Starkville, and Piecemakers of Oxford. How little my friend and quilting mentor, Alice, knew what she started when she invited me to that first quilt show. We had a fabulous turn out this weekend at our annual Spring Gathering, which was held at Lake Tiak-O’Khata in Louisville with 137 attendees. We all had a good time, got great goody bags (see pics on Facebook). I cannot say enough about the effort put forth by the Scrappers and Red Hills Quilt guilds; over and beyond ladies! And the music and the demos, wow! Thanks to all the guild members, the guests, and the presenters. We learned a lot and had fun doing it. We need a guild or two to step forward for the fall gathering, hopefully in central or southern Mississippi. Remember, two or more guilds can do this together. It does not have to be elaborate. What is important that we have a place to gather, see our quilting friends, to learn some new things, and of course, shop. All you need to do is find a venue and a caterer. We usually offer sandwiches & salads. Your planning Friday night is a plus. MQA will pay for the venue and will give you an amount for incidentals. MQA, Carol Punday, Education Director and her committee, will do the rest. Perhaps there is an already scheduled event going on in your area that could be built on. Piecemakers in Oxford combined an exhibition of Caryl Bryer Fallert-Gentry’s Quilts that was being held at the University of Mississippi Museum having the Friday night program at the museum. Please contact me or Carol with any questions or to volunteer your guild. Remember, we are only as good as our membership, so let’s make it happen! To kick off the year, here is my challenge to encourage you to be as creative as I know you can be. My theme this year is to continue growing, but now, on a personal level. I am presenting the challenge, "WHAT IF", from the latest issue of American Quilter. With permission from the author, Rose Schlatte, and American Quilter magazine, answer these questions using the following templates. You can enlarge template to any size you wish, do just a block, a section or an entire quilt. Let’s see how many interpretations you can come up with. Share your inspirations with us at the Fall gathering. What if I change the color of the triangles to a triad color scheme? What if I use on color for the triangles and another for the background of the block? What if I use tints and shades (values) of one color for the triangles? What if I change the color schedule to analogous, complementary? What if I add a triangle? What if I add 2 triangles, or 3 or more? What if I reverse the block? What if I make several reversals? What if I turn the block upside down? What if I move the triangles to align parallel with the edge of the block? What if I add more circles? What if move one or more? What if change the size of the circles? What if I further change/exaggerate one or more shapes? What if I layer different sizes of the same shape on top of each other?